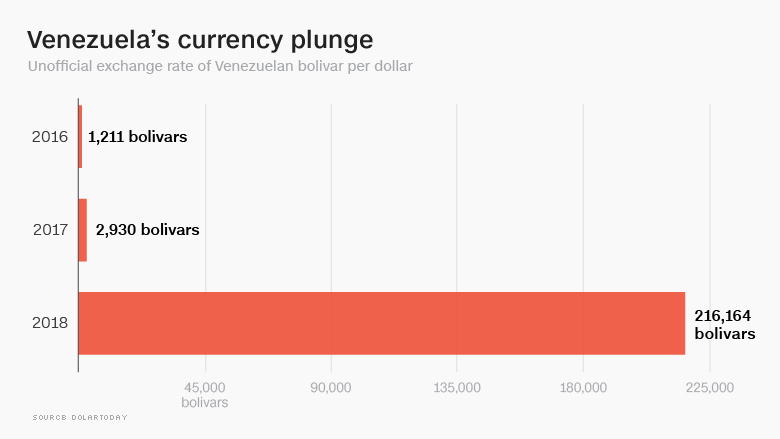 Venezuela's currency, the bolivar, lost nearly all its value last year as the country spiraled into an economic crisis. One solution gaining popularity: Get rid of the bolivar and replace it with the US dollar. The idea is called dollarization. Ecuador, El Salvador and some small island nations have done it. Now it could be coming to Venezuela, widely considered the world's worst economy not mired in an armed conflict. Venezuela has a presidential election this spring, and Henri Falcon is seen as the top opposition candidate to the incumbent, Nicolas Maduro. Francisco Rodriguez, a former Wall Street economist who advises Falcon, says he would shift the nation to the dollar to cure its biggest problem, soaring inflation. Prices are rising much faster than wages. Venezuelans are going hungry and hospitals are ill-equipped because of widespread shortages of medicine and food. The average Venezuelan living in poverty last year lost 25 pounds, according to a recently published study. That problem is likely to get worse: The International Monetary Fund projects prices will rise 13,000% this year. Some experts say Venezuela must move to the dollar before it can solve all its other problems, which include rampant crime and a mass exodus of its citizens. 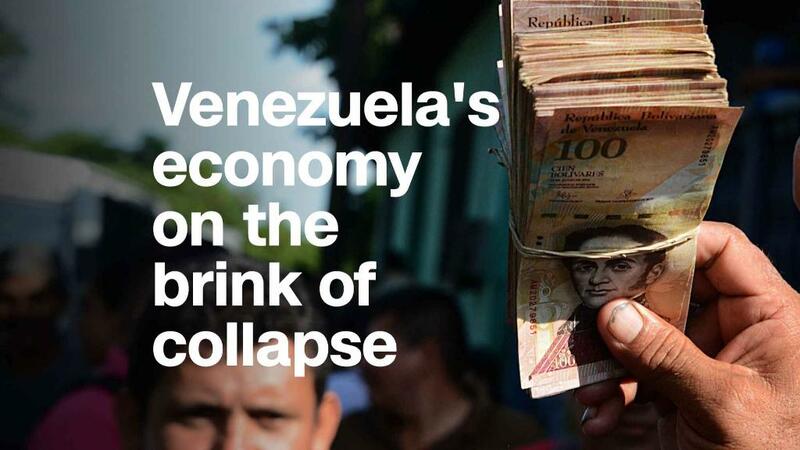 "There's no way they can get anything under control in Venezuela unless they dollarize," says Steven Hanke, a professor at Johns Hopkins University who advised the governments of Ecuador and Montenegro when they ditched their currencies for the dollar. "The bolivar is gone already." Related: You can't get $1 out of the bank in Venezuela. We tried. Here's how it would work. The government would establish a temporary exchange rate for its citizens to swap bolivars for dollars. Venezuela would have to agree to get its printed cash only from the US Federal Reserve. Governments forfeit the right to print their own money when they convert to the dollar. Venezuela wouldn't be able to order the Fed to print endless amounts of cash, either. By taking on the dollar — the exchange rate for which is controlled by foreign markets — leaders would effectively have to commit to reel in spending. To pay for cash shipments from the Fed, Venezuela would still have to make money on its exports, such as oil, and collect taxes. Experts say the transition would be easier for Venezuela than other nations because its only source of meaningful income is oil, which is bought and sold only in dollars. If he stays in power, Maduro seems unlikely to swap the bolivar for the dollar. His government spends at will and blasts US capitalism. As for Falcon, Maduro's top opponent, his team says Venezuelans would be able to exchange 68 bolivars for one dollar. Some economists say it's soon to place an exact number on what the exchange rate would be. The current, unofficial exchange rate that millions of Venezuelans use everyday is about 216,000 bolivars for one dollar. Some economists say countries give up too much control over their own currency when they adopt the dollar. Another option would be for a new government to introduce an entirely new currency along with a plan to rein in federal spending. Although unlikely to dollarize, Maduro isn't entirely opposed to a new currency in principle. His government recently created the world's first sovereign cryptocurrency, the petro. It remains unclear how successful the petro was in private auctions. The Maduro regime's spending spree — on subsidies, free housing, wage hikes and much more — has badly damaged the economy, says Raul Gallegos, a Bogota-based consultant at the global advisory firm Control Risks. "Dollarization is essentially when you chop off your left arm to prevent gangrene from killing you," he says. A move to the dollar is likely only if Falcon defeats Maduro in May, and that is uncertain. Some opposition parties have boycotted the election, claiming Maduro will rig it. Maduro has also banned some of his top opponents from running for office. The Trump administration, along with many other governments, labels Maduro a dictator. Last July, Maduro's party replaced the opposition-backed legislature with an entirely new legislature filled with his supporters. Against that backdrop, outside experts question whether this election will be fair. Rodriguez, the lead economic adviser for Falcon, did not respond to a request for comment. A Venezuelan TV anchor and Maduro supporter recently asked him whether adopting the dollar would sacrifice Venezuela's sovereignty. "You can't talk about sovereignty when you have a destroyed economy," Rodriguez said.